After dabbling in blockchain with various subsidiaries, the 2-decade-old e-commerce business is going all in on the technology by early next year. CEO Patrick Byrne plans to sell the retail arm of Overstock by February, The Wall Street Journal reports. "We think we've got cold fusion on the blockchain side," he says. Overstock plans to sell its decades-old retail business in the next few months to make way for a full-blown bet on blockchain. The previously announced sale plans could go through as soon as February, the company's CEO told The Wall Street Journal in a report published Friday. Overstock founder and CEO Patrick Byrne — an ardent believer in the technology that underpins bitcoin and other cryptocurrencies — declined to name any of the potential buyers. Shares of Overstock surged as much as 26 percent Friday but the stock is down 66 percent this year. Byrne founded Overstock in 1999 to sell goods like furniture and jewelry on the internet. He's now betting the future of that brand on multiple blockchain start-ups through its fully owned subsidiary called Medici Ventures. The Salt Lake City-based company has invested $175 million in Medici, which has been burning money since its 2014 inception: It lost lost $39 million in the first three quarters of the year, and roughly $22 million last year, according to the company's public filings. Overstock itself is in the red, with a net loss of $163 million in the first three quarters of this year. One of its best-known start-ups, tZero, a trading system that hasn't launched commercially, is also burning money. "I don't care whether tZero is losing $2 million a month," Byrne told the Journal. "We think we've got cold fusion on the blockchain side." Medici houses start-ups that go well beyond the scope of just cryptocurrencies. One company Voatz, runs blockchain-based voting through a smartphone app while another is working on digital property rights in Rwanda. While Byrne told investors in a September shareholder letter that Overstock does not "have significant holdings of bitcoin," the share price moves have been tightly correlated. 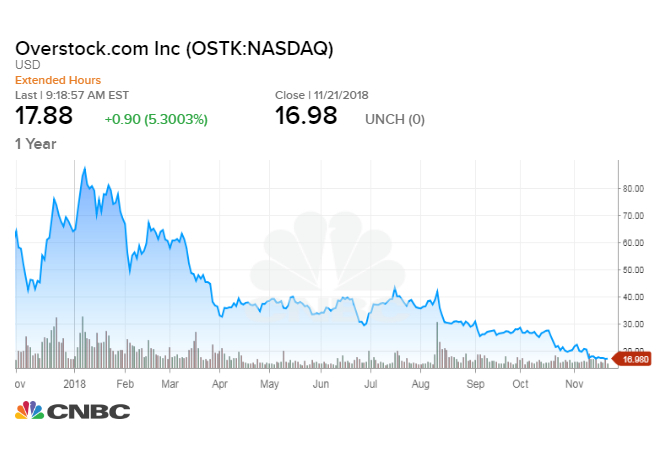 During the cryptocurrency's rise to nearly $20,000 last year, Overstock shares surged more than 400 percent from July through the end of 2018. After trading above $80 in January, the stock is down to just above $21 as of Friday afternoon. Bitcoin itself was trading above $4,200 on Friday, down 78 percent since its high reached in December 2017. Multiple Wall Street CEOs have denounced bitcoin as a scam or bubble, while Berkshire Hathaway's Warren Buffett famously likened it to rat poison. But its underlying technology is more widely accepted among public companies. IBM, J.P. Morgan, Deloitte, Amazon and Facebook are among those implementing the technology in some way. Still, skeptics abound on the blockchain side. Global economist Nouriel Roubini, one of the few who predicted the 2008 financial crisis, recently called the technology the most "over-hyped — and least useful — technology in human history."